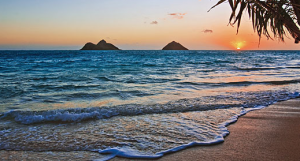 Oahu Safe Beaches for Kids – Paradise Baby Co. It is always a good time of year to travel to Oahu with kids! I like to keep my baby equipment rental customers hip to all the happening whenever I can. 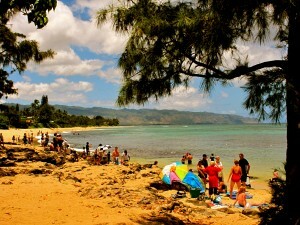 Here is my latest kid friendly beaches on Oahu list that you can’t go wrong with. 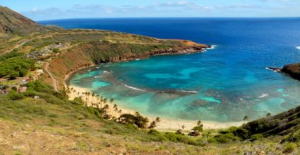 Hanauma Bay Nature Preserve is the by far the most popular place to snorkel on Oahu. The protected cove has been a Marine Life Conservation District since the 1960’s, which makes it illegal to fish or remove any marine life from the Bay. Hanauma Bay offers clam and safe swimming conditions, making the Preserve the ultimate playground for your young marine scientist to explore the reef and underwater world of Hawaii. 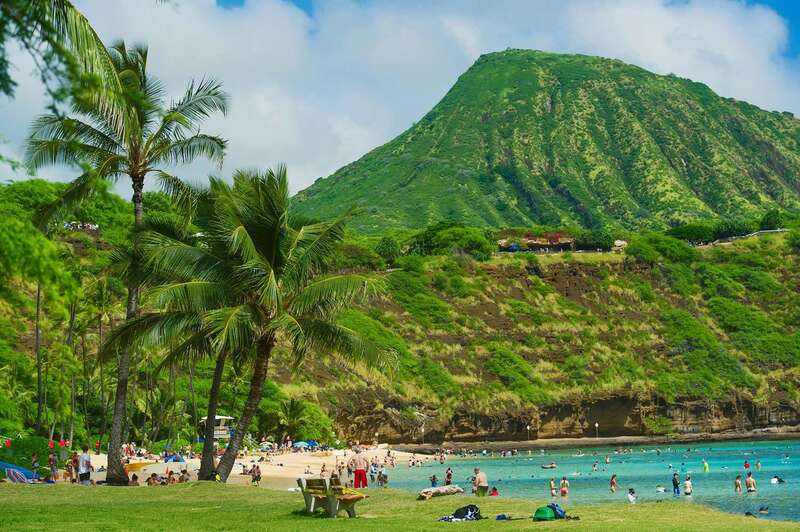 The Bay is a short drive out side of Waikiki just 10 miles East along the scenic coastline. Hanauma is curved ancient volcanic crater. What kids wouldn’t be thrilled to swim around in a volcanic crater? The Bay is full of marine life, including turtles, rays and over 400 different types of tropical fish have been recorded at the park. There is an entrance fee of $5.00 and parking is $1.00. Summer gets super crouded with only 300 parking spaces available so get there early. Open from 6:00am-7:00pm and is closed on Tuesday. There is Snorkel gear available for rent at the beach and there is also a snack shop. An added bonus all of the facilities at the Hanauma Bay are designed to be fully accessible to the disabled guests and wheel chairs are available free at the information center. For families traveling to Hawaii with kids this is a must-do activity! Kailua Beach is located on the East side of the island. Kailua Beach Park has been called one of the best beaches in the United States and I couldn’t agree more. The park has it all, visitors parking, showers, picnic areas and tons of shade. When you travel with a baby to Hawaii you want your shade! The fine white sand beach stretches for over 2 miles and there are lifeguards on duty. The shore break is generally calm and offers safe swimming conditions year round. If there is a hazard, a sign will be posted at the beach. Jellyfish can be blown in when trade winds are strong so always ask a lifeguard if there are any warnings that day. Typically Kailua beach is not crowded during the week but can get busy on weekends and during Summer. There are several kayaking rental companies in Kailua Town that can set you and the family up for a day of paddling around the pristine waters of the bay. After spending the day at the beach there are many great family friendly restaurants in Kailua to choose from. I get a lot of customers asking about whether there is kid friendly and safe swimming at the Aulani Resort and Ko Olina beaches. I would have to say yes indeed! Located on the West Side of Oahu the lagoons at Ko Olina offer some of the safest swimming for kids on Oahu. There are 4 separate lagoons that are protected by an outer rock barrier. They are sand bottom and surrounded by white sand and grass lawns that are perfect for a picnicking. There are lifeguards on duty at all the swimming areas as well as beach gear rentals available. The Disney Aulani Resort is the newest addition to the Ko Olina Resort area. I have heard from several people that rented baby equipment at Aulani say that Aunty’s Beach House is a great place for kids to hand out beach side. Also available at Disney Aulani are Kayaks, stand up paddle boards and snorkel sets. If you don’t feel like packing a lunch there are lots of award winning restaurants to choose from both at Ko Olina Beach Club and the Ihilani hotels. WHERE IS TURTLE BEACH on Oahu? Ok, heads up for anyone going to drive all the way to the North Shore to find at Laniakea. It can be a nightmare! The beach has become way over crowded with tourist and traffic can make the hour trip from Waikiki a 2 hour trip once you get close. Super bummer for driving. Turtles can be found swimming all around the islands waters no matter where you are staying. If you are going to make the trek to the North Shore to see a turtle start in Haleiwa town. There are a couple beach parks Haleiwa and Alii Beach park that you can also get a chance to see Turtles bathing. These beaches have plenty of parking and restrooms. Save yourself the hours in traffic by checking out turtles in Haleiwa! 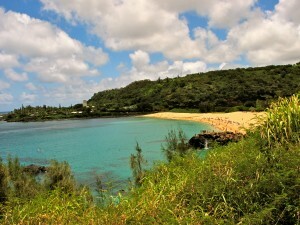 Waimea Bay is famous for it’s gigantic winter surf that can reach 50 plus feet during the months of Oct- March. Surfers come from all over the world to take on the monster waves of the North Shore, which can be quite exciting to watch. However, for many of us locals we look forward to the calm conditions when there are no waves. As the large winter swells diminish, spring thru summer time at the bay could not be more fun for a family with kids. Waimea Bay has some of the most beautiful clear picturesque water on the island, making for great diving and swimming conditions. The small park has restrooms and lifeguards on duty year round. Be sure to bring snacks or stop off in Haleiwa Town for food on your way to Waimea. The closest food is a grocery store called Foodland about a mile away. This is a beach that you will always want to check with the lifeguard before swimming. 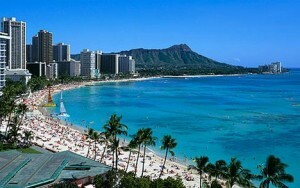 Finally, one of the most famous beaches in the world, Waikiki Beach, is an amazing beach for families on Oahu. If you are visiting Oahu chances are you are staying in Waikiki and lucky for you have the safest swimming beach right outside your hotel. The wonderful white sand beach offers not only calm swimming conditions but lots of great beach activities. For older children that can swim surf lessons are just about the most fun you can have in Hawaii. The beach boys of Waikiki are world renowned for their water safety skills and are all amazing surf instructors. The gentle waves of Waikiki make it the ideal place to learn to surf. Canoe rides are also a blast and you can book a ride next to the Royal Hawaiian Hotel on the beach. This is an activity the whole family can enjoy. After a long day at the beach locals and visitor alike favorite thing to do is walk straight off the beach into Dukes at the Outrigger for sunset time. There is great live Hawaiian music and pupu’s (appetizers) every night. If you ever have any questions for other activities for kids on Oahu we are always happy to help. Voted in Honolulu Magazine Best of Honolulu 2012 Paradise Baby Co. took first as Best Baby Equipment Rental Oahu!